Art is never intrinsically so. As a meaningful category of experience, art is part of a socially constructed way of knowing the world and the objects it contains. Thus, the typical art historical contrast between fine art . . . and tourist art . . . or similar contrasts drawn between different rungs of social hierarchy in the same society are the straw men of aesthetic philosophy (1). A few months ago I perused an antique mall. Not the sort of place I hang out. I like old things. I like pretty things. I like valuable things. But I can’t afford them. I was there to buy something (what?) to place on the antique blanket chest I inherited from my late partner. 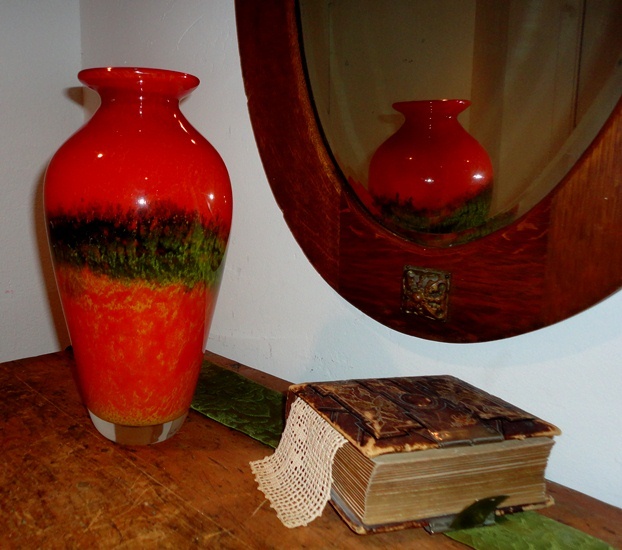 On it is a red vase I bought a few years back (on my last trip to an antique mall). It needed a companion piece. Buying things for me simply because I want them began about a year ago when I emerged from a ten-year depression (the worst high-low period of my Bipolar II life). I lived in a space furnished with left-overs from my relationships. Little was ‘mine.’ I’d helped purchase some of it, but, left to my own tastes, I would have chosen little of what I owned. So I began a slow and concentrated effort to change my surroundings. The day I was in the antique mall was emotionally difficult. I was hurt and in pain and fearful–for real reasons, not because of chemical imbalance. I was in the mall specifically to do something extravagant for myself that would make me happy. Shopping isn’t usually my drug of choice. I came upon a blue glass thing. 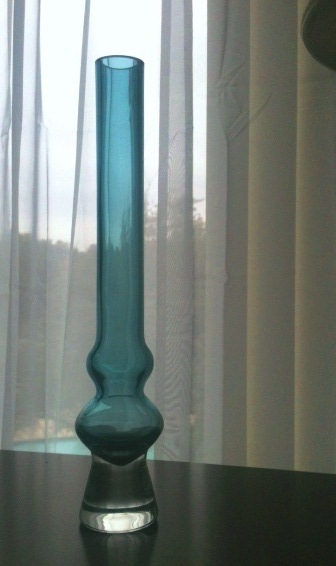 The tag said ‘vase, 18 inches tall.’ I loved it. I thought it was beautiful (and still do). I like beautiful things that look bold–clean lines. Nothing frilly, thank you. I went back and carried the blue thing to the register. The sales woman said, ‘Wait, that has the Waterford box,’ and off she went to find it. Waterford. Well, no wonder I liked it. Didn’t look like any Waterford I had ever seen, but what do I know? The blue thing has a life of its own in my heart. I’m emotionally attached to it because I found it on a day I was hurting and afraid and needed to do something for myself. Later that day, my worst fears came to fruition, and I was devastated. But I had my blue thing. How, I ask myself, can something as useless as the blue thing that may take a meal from me when I’m retired because I withdrew money from my meager savings to buy it have such importance? And where did I develop the taste to think it’s beautiful, regardless who made it? Where do we get our ‘taste,’ anyway? 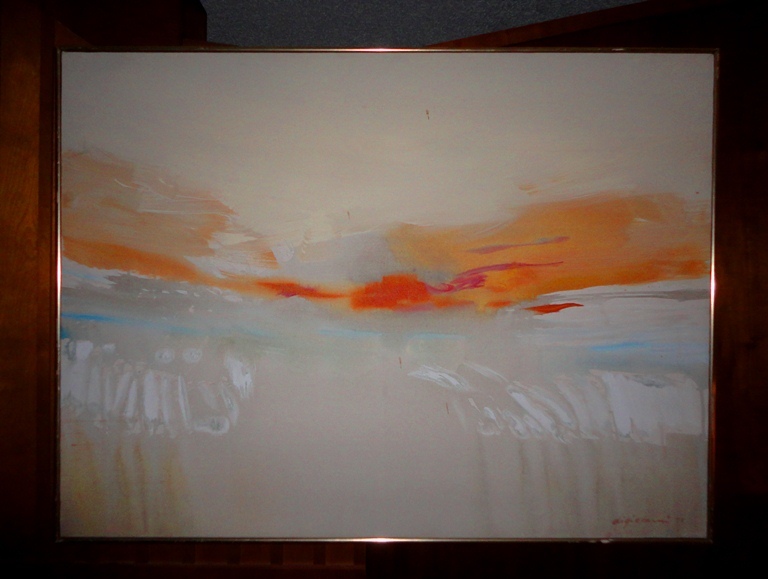 Growing up gay in a Nebraska Baptist parsonage, I had little access to beauty, much less art. But my Missouri-born father had impeccable taste. From where? He had a college degree, but that’s not the source of his taste. His Arkansas-born mother kept a home as ‘tasteful’—I did not say ‘artistic’—as could be, and she was highly skilled at sewing and hand work. How did she come by her taste? In the mid-1960s, Susan Sontag coined the term ‘new sensibility’ to indicate . . .that the distinction between high and low culture was becoming ‘less and less meaningful’. This was one of the first affirmative accounts of the blurring of high and low culture, and retrospectively one of the strongest early prophecies of the fall [of the old idea of taste](2). Or was it hanging with real musicians through my education? I know what the elite like. I have a PhD in music. That’s where I developed my taste. Or is it? If I had to choose one style of music for the rest of my life, I’d have difficulty choosing between Beethoven string quartets and John Coltrane. Between Bach cantatas and the Beatles. Between Beverly Sills and Janis Joplin. I’m researching the composer David Diamond, one of those responsible for the queering of America’s classical music (4). Diamond took his life-long friends, Leonard Bernstein and Aaron Copland to task for selling out to commercialization. But Aaron Copland became the Father of the sound we associate with “American music.” Where did his taste come from? Stay tuned for pictures of my newly ‘tasteful’ apartment and my writing about David Diamond. Then help me decide where it all started. Why do I love my blue thing? (1) Sharman, Russell Leigh. “The Invention of Fine Art: Creating a Cultural Elite in a Marginal Community.” Visual Anthropology 17 (2004): 345–367. (2) Bjurström, Erling. ‘Cultural policy and the meaning of modern and post-modern taste, with concluding remarks on the case of Sweden.’ International Journal of Cultural Policy 14.1 (February 2008): 65-78. (3) Vitagliano, Paul. Born This Way: Real Stories of Growing up Gay. Philadelphia, PA: Quirk Books, 2012. (4) Hubbs, Nadine. The Queer Composition of America’s Sound: Gay Modernists, American Music, and National Identity. Berkeley, CA: The University of California Press, 2004.